You are here: Home / Parenting / Toddler / Simple Tricks to Brush your Toddler’s Teeth without a Fight: What Finally Worked for Us! 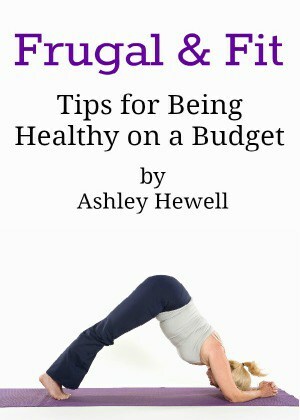 I know that this time can be frustrating for both a parent and the child but it’s something that has to be done so that they will have healthy dental habits as they grow older. 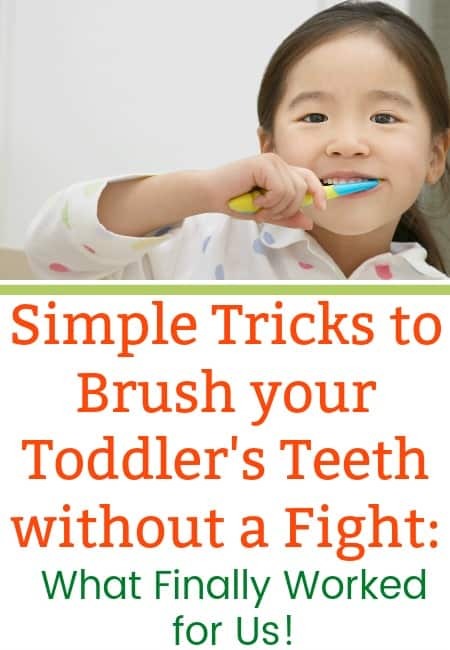 I know that every child is different and these tips may or may not work for you but they are worth trying if your toddler won’t brush their teeth. This was one of the first things that really worked for us. Kids love being silly and you have to find a way to make brushing teeth fun in order for them to cooperate. I would tell her that there were monkeys, elephants, tigers, etc in her mouth and I had to brush them out before they ran away. She thought this was hilarious and would even tell me what animals to look for and would open her mouth nice and wide so that I could brush them out. Pick a subject that your child loves: dinosaurs, fairies, favorite TV characters, etc. and see if it works. Once my daughter grew bored of hunting for animals in her mouth, I knew that I had to get creative. She loves to sing and make up songs so I figured we could make up a song while I brushed her teeth. For example: “There was a princess who loved to read and Belle is her name-o, B-E-L-L-E” and so on. She loves choosing the princess to sing about and I make sure that she knows I will only sing it if she opens her mouth and lets me brush her teeth. If she closes her mouth, I stop singing. It’s silly but it works! This is the ultimate sanity saver for brushing your toddler’s teeth, at least it was for us. The BrushyBall really makes my daughter look forward to brushing her teeth. I was sent one so that I could include it in my 2017 Holiday Gift Guide and really didn’t have much of an expectation for it. We tried it and she loved it! The BrushyBall is a toothbrush holder, timer, and training coach all in one. 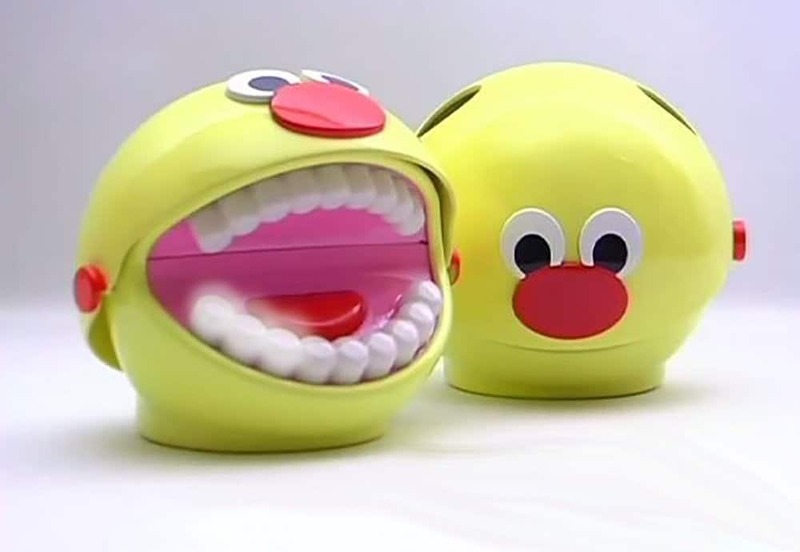 It plays a little song and tells you which teeth to brush and shows you by the teeth lighting up. Your child simply follows along and brushes their teeth where BrushyBall tells them to. My daughter loves the music and looks forward to opening his mouth every time we brush her teeth. This is a great teaching tool because it reminds them to brush the back of their teeth and for the correct amount of time to really get them clean. We have been using it since last November and she still looks forward to brushing her teeth. We haven’t had a meltdown since! Well, at least not over brushing her teeth. A lot of kids want to be independent around this age and brushing your toddler’s teeth is no exception. My daughter thinks she can do everything herself. I let her brush her teeth first and then once she is done, I tell her that I need to get anything that was left behind on her teeth. This is a great way to let her learn how to do it herself while at the same time making sure the job is done properly. Once she is done brushing her teeth, she usually will let me finish it without any tantrums. 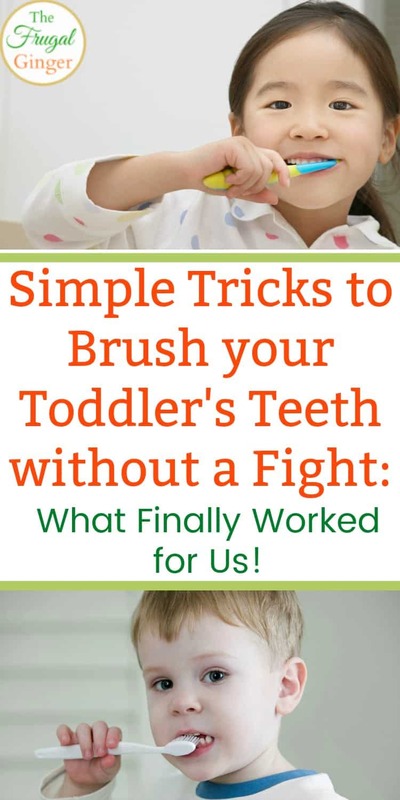 Like I said, these tips may not work for everyone but it is a good place to start if you are struggling to brush your toddler’s teeth without a fight. I’ve been there, I know how frustrating it can be, but it does get better. Just keep trying new things and eventually something will work for your family. Good Luck!